On September 11th I was taken into a vision where I saw a wheat field that went on as far as I could see in every direction. As I looked out upon this golden sea of wheat, suddenly thousands of butterflies emerged. They flew out from the stalks of wheat and took flight in all different direction. It was one of the most beautiful visions I had ever seen. 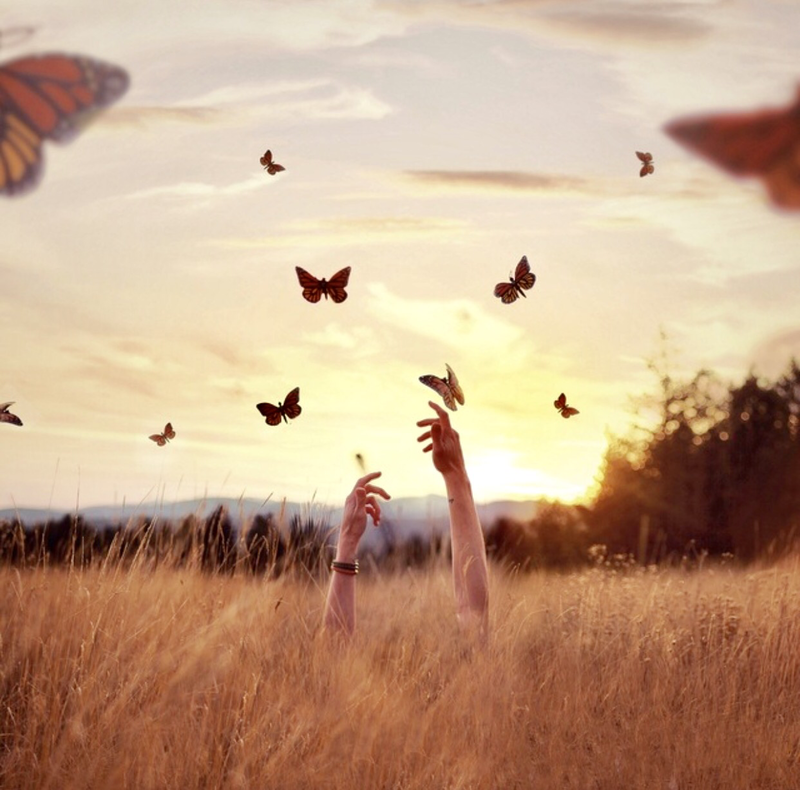 What had begun as a dirt field had transformed into a golden field of what appeared to be wheat but was actually thousands upon thousands of butterflies that had just emerged from their cocoons. And, what I thought were stalks of wheat were actually hands and arms that had cocooned these beautiful transformed lives. Transformation is now happening in the Earth’s fields. Lives that crawled upon the ground like caterpillars have been enveloped in an atmosphere of love by those who worship, those who pray and those who go out to prepare the way. They have created a safe environment for transformation and metamorphosis to occur in lives, cities and nations. We often hear our planet called “Mother Earth”. Though this is not a Christian term, I saw a picture of the earth and she was pregnant and about to give birth. The church is the midwife that is assisting with the birthing of these multiple sons and daughters. Then suddenly, the time of birthing will arrive. The time of labor and transition is upon her even now and very soon the children will come forth. Like the thousands upon thousands of butterflies in my vision, so will be the sons and daughters born into the Kingdom of God upon planet Earth. Transition is happening not only in individual lives but in cities as well. People are being brought to cities and regions where preparations have been made in the land and in the spiritual atmosphere that will result in a great harvest of souls. This week I heard a report that in my city alone a thousand people each week are relocating here (Portland, Oregon). A thousand per week!!! Why? Because the church as been preparing the city and shifting the spiritual atmosphere for many years to make this a place where seeds will grow, where caterpillars can be changed into butterflies, where orphans can become sons and daughters and strangers can find family. It will be a “city of refuge” and a resting place for our God. There are many such cities throughout the earth. The lost may believe that they are moving for reasons that are economic, political, social or educational but they are actually seeds in the field of that city or caterpillars that are about to transform in the place where prayer, praise and workers have been sent. God is also sending prepared workers to these cities to complete the preparation and serve in this great harvest and move of God. The preparations have been happening for many years. The church as been pregnant with the promise of giving birth to these sons and daughters for so long now that many abandoned hope and others allowed hope deferred to give birth to doubt. Like Sarah, who laughed when the promise of motherhood was given to her in her old age, many have laughed at these cities who seem the most unlikely to give birth. BUT GOD!! Hebrews 11:11 will emerge once again and “Sarah-Cities” will suddenly give birth to the promise of the Lord. Though the waiting time has been long; the promise will come forth! Transition is happening even now. It is opening the way for the birthing of the promise. Change is in the air and desires fulfilled will be birthed. Sarah’s arms will be filled and she will look into the face of her promise fulfilled. Spiritually desolate cities will suddenly become cities of joy! It is far closer than we can imagine…though the promise has tarried, suddenly it will be fulfilled. This entry was tagged 11:11, breakthrough, butterflies, citytransformation, desirefulfilled, Encouragement, Hope, JOY, kathipelton, miracles, Prophesy, propheticword, Supernatural, vision. Bookmark the permalink.